I don’t know if I was more fascinated with colours in my early years than the other children around me, but it sure felt like I was. Part of that may have had to do with my artist’s brain, but the fact that my father was a visual artist, who loved classic cartoons as much as I loved the stuff I was watching on Saturday mornings back then (which didn’t age nearly as well), meant that looking at “the pretty colours” wherever I went was a big part of my childhood. We had a lot of early computers around our house at the start of the 1980’s, and I learned BASIC programming around the time that I started kindergarten, so I wound up making a whole lot of “pretty colours” when I was very young, without the usual mess involved with painting and such. My visual arts skills have never been that great when I’m stuck using only my two hands, but I’ve always had enough design sense to be able to do some decent computer-generated art (including all of my book covers). One of my most vivid memories of my earliest years was my parents taking me to Southwyck Mall in Toledo. My favourite place there was Old Towne, the early-style arcade, but the fountains there were a close second. All throughout the mall, there were square fountains that bubbled up water, but the coolest thing about them were the coloured lights set into the bottom, which created a play of shimmering light and water that grabbed my attention and wouldn’t let go. (You can see some of the fountains in this video filmed just before Southwyck closed in 2008.) My parents often gave me pennies to throw into the fountain to make wishes with, a tradition that I moved to the big fountain in the middle of Levis Commons after Southwyck shut its doors for the last time, but even at Levis Commons I’d think of going to Southwyck as a youngster as I was throwing pennies into that fountain. The fountains at Southwyck were eye-catching, but they were just decorative. The park I grew up half a mile away from, Wildwood Preserve Metropark, used the colours of the rainbow to mark its different trails, and from my first visits there (I went to the school that bordered the park from kindergarten through third grade), the trail markers attracted me not only because of their use of bright colours, but also because of their simplicity. They were just white arrows on coloured circles, but beyond being visually attractive, they were effective in a way that my young mind couldn’t grasp on a conceptual level right away, but which definitely informed my early studies (and practice) of visual design. That combination of rainbow colours and minimalist design continues to hold my attention whenever I see good examples of it. As well-documented as my apathy towards Final Fantasy 8 is (especially in comparison to its predecessor), I’ve always thought that Balamb Garden was one of the most beautifully-designed structures in the history of Final Fantasy games, and I’ve given more than a little thought to how to design a home with the same basic structures and features, especially the colour-coded paths to all the different wings. I’d have to scale it way down to make it economical enough to build, of course, and I’d probably have to ditch the whole “also turns into an airship” thing, but I’d love to live in a place that was designed so beautifully. I don’t see many examples of that kind of design these days. 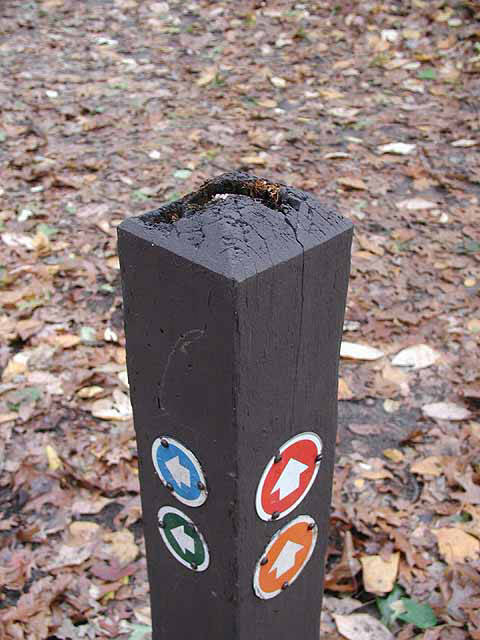 Southwyck Mall was torn down months after it closed, and Wildwood’s signage went through a complete redesign shortly before I left Toledo, the old trail markers replaced with ones that weren’t colour-coded like those iconic arrows in circles. Even if I moved back to Toledo, those touchstones of my early life only exist now in photos and videos and my memories. Other examples of that kind of design exist, of course, and I love looking at them online, but they’ll never have the same emotional heft for me as the fountains at Southwyck and the old trail markers at Wildwood. Maybe it’s only natural for me, as my life grows more hectic and the world around me becomes ever more complex, that I find myself yearning for the simplicity of those “pretty colours” and how effectively they worked on my young brain. Maybe there’s something deeper going on here than my limited understanding of neurology is allowing me to uncover. Whatever the reason, I’m definitely missing the colours of my youth right now.